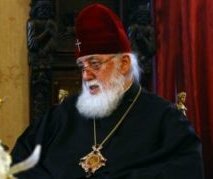 TBILISI, DFWatch–The Georgian Patriarch’s Christmas epistle is causing a reaction among human rights groups in the country. The Patriarch believes that adopting a child is desirable. Human rights activists today showed up at the Christmas procession Alilo to protest against the Patriarch’s statements. He has great influence among the population in the country. According to public opinion polls, Ilia II is the most trusted person in Georgia with more than 90 percent. Participants at Alilo protested against her and said she didn’t have a right to participate in Alilo with such a poster, as it is a holy day and her actions are an insult to the day. Khachapuridze tried to defend her opinion, but finally the police came to calm down the situation. 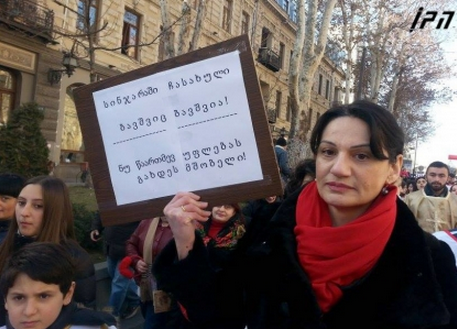 Khachapuridze said people were aggressive to her and broke off her participation in the procession. Later on Tuesday, Zurab Japaridze, a member of parliament from the National Movement, published a statement addressed to the Patriarch, in which he writes that according to the World Health Organization, infertility is a problem for 15 percent of the world’s population and in 40 percent of the cases it is impossible to determine the reason. He writes that considering difficult economic situation Georgia is in, the possibilities of medical diagnostic and treatment is far from Western countries, and this problem is even more difficult in this country. “Most people dream of having a child. In many cases the only and final chance is in vitro fertilization or using the services of a surrogate mother. Both are pretty expensive,” he writes, continuing that the desire to have a child is so high that even very poor people sell their property, their house or land, in order to have a child this way. The MP thinks the church must pay more attention to such families and children and not alienate them, as according to Christian teachings, the birth of every person is the will of God, no matter how they were born. “Restore the belief in these families where there are children born by in vitro fertilization or surrogate mothers, that children are present from God and not the wrath of God,” the statement reads. 3000 children are born in Georgia through in vitro fertilization, according to Archil Khomasuridze, President of Georgia’s Reproduction Federation. Mariam Kukunashvili, Director of New Life, which is network of in vitro fertilization clinics, told Channel 1 she has children who were born with the help of surrogate mothers in 2011 and they were baptized by the Patriarch. She says that about 50 couples come to her center per month to use the clinic’s services. According to her, there are about eight clinics offering in vitro fertilization. Giorgi Kavkasidze, a Georgian scientist working in Switzerland, on Tuesday responded to the Patriarch’s epistle. He wrote that 25 years ago, on December 6, 1988, he and Sir Robert Geoffrey Edwards met with Catholicos Patriarch Ilia II to discuss the issue of in vitro fertilization. Robert Edwards was an English physiologist working in reproductive medicine and in vitro fertilization. Robert Edwards explained to the Patriarch the methods and essence of in vitro fertilization, which Kavkasidze translated for Ilia II. At the end, the professor asked for the Patriarch’s opinion, who then said he liked Edwards’ achievements. “If your method will help a married couple to solve their problem of infertility, I bless you,” Kavkasidze remembers Patriarch saying, and asks what has happened after 25 years. A protest is being organized via Facebook for Wednesday at 16:00 outside the Patriarchate in Tbilisi.